For trashy fields, pulverizing, cultivating, breaking up clods and destroying early weeds. The flexibility allows the individual tooth bars to pass over obstructions while the other bars stay on the ground. 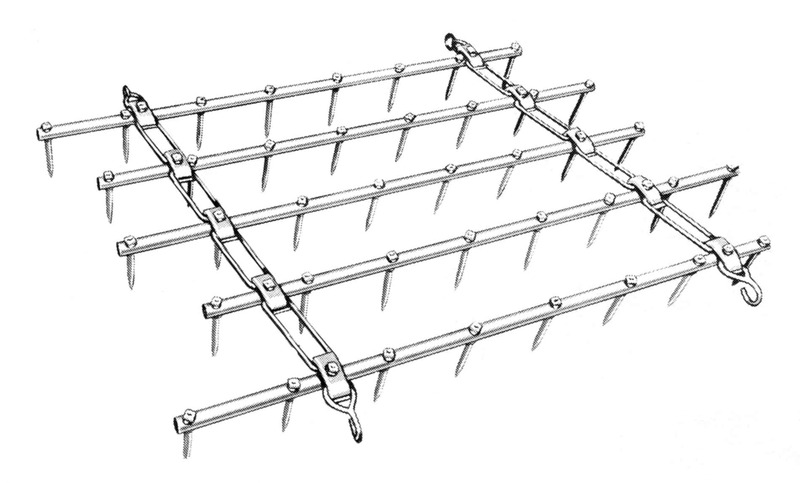 When the harrow is drawn from the front, the teeth are vertical for cultivating and penetrating deep into the soil. When drawn from the rear, the tooth angle is preset for self cleaning and smoothing. 1 5/8” O.D. High carbon heavy duty pipe for greater strength at high speed tractor operation and cultivating. 9/16” Specially welded for extra strength and less wear. 9/16” hooks are designed with the open ends toward the ground to reduce unhooking during operation. High carbon, hammer-forged to a diamond hard point, for hard use in all soil conditions. The teeth can be used to cultivate, pulverize, smooth and break up crust and clods. Each tooth is reversible and replaceable. Teeth are locked on with a lock washer and nut, and are guaranteed to outlast any other tooth of equal weight.